The Rev. Harry A. 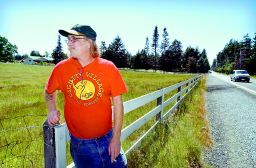 "Hank" Montgomery, an advocate of a tent city for the homeless, surveys one of two potential sites, an 11-acre pasture near 160th Street East and 16th Avenue Court East in Spanaway. The other is located in Northeast Tacoma. Tent cities, like the one that recently sprouted on the grounds of a Bothell church, are showing up all over the country. The semipermanent and sometimes mobile homeless camps offer a safe alternative to sleeping on the street or under a bridge. But they're also wildly controversial. And it's probably just a matter of time until Tacoma gets one. "It's going to happen," predicts the Rev. Harry A. "Hank" Montgomery, a long-haired street preacher who variously wins friends and ruffles feathers in his quest to build "Destiny Village," a homeless camp modeled after Portland's experimental Dignity Village. He's currently looking at locations in Northeast Tacoma and in Spanaway. "It's going down," Montgomery said, "and there's nothing you can do about it." Until recently, Montgomery didn't have much support for such a bold statement. The 54-year-old co-founder of Under the Bridge Ministry, who lives in a van and showers at the YMCA, butted heads with many of the leaders of Tacoma's social service community when he started showing up at their meetings. "He's annoying and miserable," said Robert Rowlands, co-chairman of the Tacoma-Pierce County Coalition for the Homeless. But Rowlands added that advocates for any cause often are. And Montgomery has good intentions, he said. In the space of a few months, Montgomery mellowed his approach at the homeless coalition meetings and members of the coalition started to share his belief that some kind of tent city or homeless camp in Pierce County is inevitable. Several members of the loose-knit coalition recently formed a committee to look into the pros and cons of a tent city and the various models that could be used to operate one, said Helen Myrick, co-chairwoman of the coalition. And representatives of SHARE/WHEEL, the group behind the Bothell tent city, spoke at a recent coalition meeting in Tacoma. "Homelessness is unacceptable in Pierce County," Myrick said. "If we're serious about that, we need to have an array of options." A tent city might be one, she said. Mindful of the controversy that tent cities often generate, she added, "We haven't made any commitment to do anything at this point." Violence against homeless people is one reason tent cities are flourishing across the country, said Donald Whitehead, executive director of the National Coalition for the Homeless. In addition to Bothell and Portland, large-scale tent cities have been built or discussed in Los Angeles, Denver, Miami, Honolulu, Toronto and Vancouver, B.C. A proliferation of "bum videos" in the last few years helped bring attention to what his organization calls an alarming increase in the number of assaults on street people, including the recent torching of a homeless man sleeping on a bench in Corpus Christi, Texas. "As a last alternative, it is a good thing for homeless people to be congregated together rather than being alone and susceptible to violence," Whitehead said. "We don't support this as a final alternative." In Pierce County, white supremacists beat 42-year-old Randall Townsend to death in March 2003. Steven Trevino, 30, died last September after a fight with an acquaintance. And Arnold Farmer, a 78-year-old Army veteran who used a wheelchair, was beaten to death in a parking lot last November. "We need housing now so people stop dying," Montgomery said. Finding the right location could pose a challenge. Earlier this month, Montgomery expected 100 people to pitch tents on a parking lot near the Tacoma Dome, but it never happened. The City of Tacoma leases the property from the Washington state Department of Transportation and couldn't give permission to use the lot for a tent city, said assistant city attorney Steve Victor. Now Montgomery is looking at two more potential tent city locations: a hillside above Marine View Drive in Northeast Tacoma and an 11-acre pasture in Spanaway. In both cases, he said he has the permission of the property owner, and he believes either one would work. He favors the Spanaway location because it's less rugged, although it comes with challenges as well, primarily transportation. It isn't on a bus line, Montgomery said, so organizers would need to operate a shuttle. Kyle Crews, a Tacoma assistant city attorney, said Montgomery would run into trouble getting a building permit for the Northeast Tacoma property because of the lack of water and sewer. Even a tent requires a building permit if it's going to be used as a semipermanent living quarter, Crews said. Pierce County spokesman Ron Klein said he hadn't heard about Montgomery's plans, but said he would need to abide by the county's codes. "We'll have to wait and see what the plans are, if any," Klein said. Wherever he looks, Montgomery is likely to run into opposition. Neighbors frequently oppose tent cities, and a recent editorial in The Oregonian newspaper declared the Dignity Village experiment in Portland to be a "pipe dream." The newspaper cited the growing waiting list to get into the village and the lack of turnover among residents as evidence that the camp fails to help people transition into more permanent housing. Tacoma City Councilman Mike Lonergan, who is also the executive director of the Tacoma Rescue Mission, said he opposes a tent city in Tacoma because he believes it would perpetuate homelessness. "My own efforts, for a quite a few years in the Tacoma Rescue Mission, are to help people not to be homeless," Lonergan said. "To me, a tent city seems to be surrendering the struggle for the homeless person, to say they might as well live in a tent or a shack." Councilman Bill Evans said the tent city phenomenon is an unfortunate reflection of the times. "There's no reason to expect Tacoma would not be a part of the phenomenon," Evans said. Montgomery hopes a decision will be made on a location early next month. He is eager for Destiny Village to get up and running. Myrick predicts it won't happen as quickly as Montgomery would like, but she believes something good will be accomplished in Pierce County. It might be a tent city, she said. Or a homeless camp along the lines of Dignity Village. Or something else. "The current model," Myrick said, "is just not adequate. We need to get creative."